This project involves the utilization of fish (tilapia, dalagangbukid and maya-maya) for longganisa. This also compares the use of nitrite and non-nitrite in the formulation. The formulated fish longganisa were evaluated on its appearance, color, odor, texture and flavor using 7-point hedonic scale and general acceptability using 9-point hedonic scale. Preference test was conducted to 20 consumer panels to further validate results. Statistical treatment used were Analysis of Variance and Kramer's Rank Sum Test for Hedonic Rating and Preference test, respectively. Direct material cost was computed in each product. Results showed that all products were non-significant between and among product samples in terms of the five sensory attributes and general acceptability. Kramer's rank sum test indicated that the fish longganisa with and without curing salt were non-significant between and among samples except for maya-maya with curing salt. This was the least liked fish longganisa. Direct material cost ranged from PhP31.00 to PhP 54.00 per 240 gram pack with tilapia exhibiting the lowest cost and maya-mayathe highest cost. INTRODUCTION Longganisa is a very popular breakfast meal among Filipino folks. However, these are commonly made of pork or chicken. With increasing health-conscious Filipinos who limit themselves and veer away from fatty food and with more than 60 percent of the Philippine population living within what are considered coastal areas, it is very important to innovate and develop variety of marine food products. Processing marine products needs to be diversified because all major cities and most large industries are located close to the sea. Continuous innovationand development of food products at different variants should be done. Hence, this study involves the exploratory activity of developing a breakfast meal made of fishery product. The fish species considered in this study provide a healthy and less expensive alternative to meat. Tilapia (Tilapia mossambica)is rich in protein and contains all the essential amino acids required by the body to help build proteins. Protein helps in building, maintenance and repair of body tissues. Moreover, tilapiais a rich source of omega-3 fatty acids, which are important for growth and development in children and brain function. It also helps in body weight control and is naturally low in fat, thus, may help reduce the risk of heart disease and sudden cardiac death.Dalagang bukid, Caesio/Fusilier, golden (Caesio chrysozonus), contains higher protein (21.5%) when compared to tilapia (18.1%) andmaya-maya (15.6%). It is highin both phosphorusand potassium. Phosphorus content is 233 mg per 100 g edible portion (FNRI, 1997). Potassium content is 420mg/100g per serving (http://www.myfitnesspal.com/food/calories/dalagang-bukid-yellow-tail-fusilier-452190967). Phosphorus helps in the formation of bones and teeth. It plays an important role in body'sutilization ofcarbohydrates and fats. It is also needed by the body to make protein for the growth, maintenance, and repair of cells and tissues. On the other hand, maya-maya or Red snapper /Malabar fish (Lutjanus malabaricus) contains a high concentration of the mineral selenium. It is low in calories and rich in vitamin A, potassium and omega-3 fatty acids. Selenium supports white blood cell function and is required for the thyroid gland to work properly. It acts as an antioxidant that may prevent rheumatoid arthritis, cancer and heart disease. Vitamin A is vital for the immune system, the production and maintenance of bones and the health of the skin and eye. It may decrease the risk of developing eye disorders like cataracts. Potassium is required in energy metabolism and for cardiac and skeletal muscles to contract properly. Omega-3 fatty acids may significantly reduce the risk of heart disease, atherosclerosis and high blood cholesterol. Longganisa originated in Spain, Chile, Mexico, Puerto Rico, Dominican Republic, Philippines (Lucban - Garlic Laden Derecado, Guagua - Salty/Sour, Alaminos, Tuguegarao, Cabanatuan, Cebu, Calumpit, Bacolod, Pampanga, Guinobatan), etc. It is a long, pork sausage seasoned with paprika, cinnamon, anise seed, garlic and vinegar. Others formulated longganisa with reduced fat due to health-conscious consumers. Here comes longganisa made of fish. The Philippines is among the largest fish producers in the world. The commercial, municipal and aquaculture fisheries account for 36, 30 and 24 percent of the total annual fisheries yield, respectively. It is but practical that each area should utilize abundant fish species for livelihood products. This is adding value to the fish species. This study is limited to three species:tilapia, dalagangbukid and maya-maya. The target species were based from its high yield of edible portion ranging from 44 to 69%. Tilapia, known as Tilapia mosambicaplayssecond to milkfish in cultured fish in the Philippines. It gives 46% edible portion (FNRI, 1997). It is abundant in all cultured area and available in all areas. Dalagangbukid on the other hand is abundant in Bicol, Cebu, Tacloban, Palawan, Ilocos, Negros. Dalagangbukid is a pelagic saltwater fish belonging to the family Caesionidae. It is a small to medium-sized fish which grows to about 40 cm (16 in) long.The edible portion of dalagang bukid is 69% (Ibid, 1997). Lastly, Maya-maya is a generic name for the snapper fish. The most common fish referred to as maya-maya in the Philippines is a reddish fish. It is abundant in the Atlantic sea. Its edible portion is 44% (Ibid, 1997). Nitrates and nitrites are frequently added to processed meats partially oxidized to nitrate by sequestering oxygen - thus it acts as an antioxidant - a part of nitrite is bound to myoglobin, forming the heat stable NO-myoglobin, a part is bound to proteins or other substances in meat. Nitrate may be reduced to nitrite in raw meat products by microorganisms.It functions as antimicrobials in the digestive system, helping to kill pathogenic bacteria like Salmonella. They can also turn into Nitric Oxide (NO), an important signaling molecule.They function as preservatives, helping to prevent the growth of harmful bacteria. This compound is active against both anaerobic and aerobic food-spoilage bacteria.They also add a salty flavour and improve the appearance of the meat products by giving them a red or pink color.Nitrites are the reason cured meat is pink or red. Nitrites turn into Nitric Oxide, which reacts with the oxygen-binding proteins in the meat, changing its color. Without additives like nitrites, the meat would turn brown very quickly. 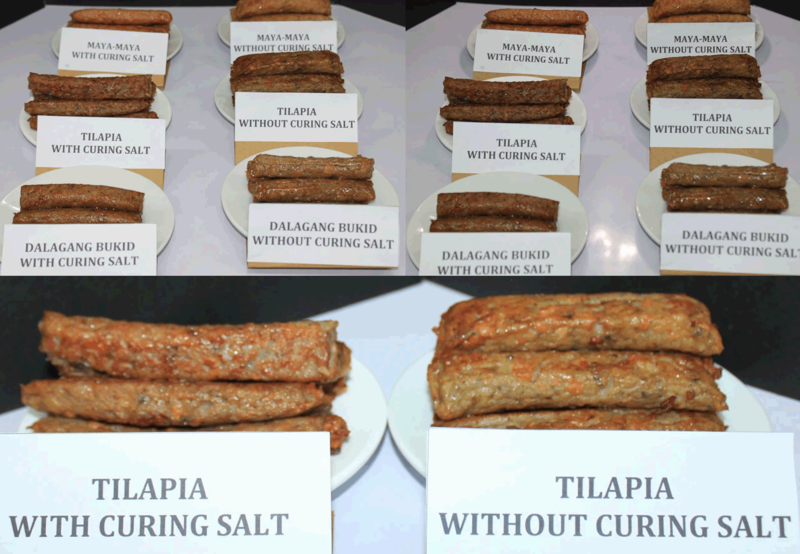 With the above important points on fish longganisa, this study aims to determine the acceptability of fish longganisa made of tilapia, dalagangbukid and maya-maya with or without nitrite. Its assumption is there is no significant difference between and among the different fish species (tilapia, dalagang bukid and maya-maya) when treated with or without nitrate forlongganisa.